We were woken up this morning by sunlight streaming in through the windows of our room. Such a contrast to yesterday afternoon, when we walked in the middle of the road to avoid the ankle deep rivers of water running down either edge of each street. After a disappointing breakfast in the hotel (which was included with our room – again, a total rip off!! 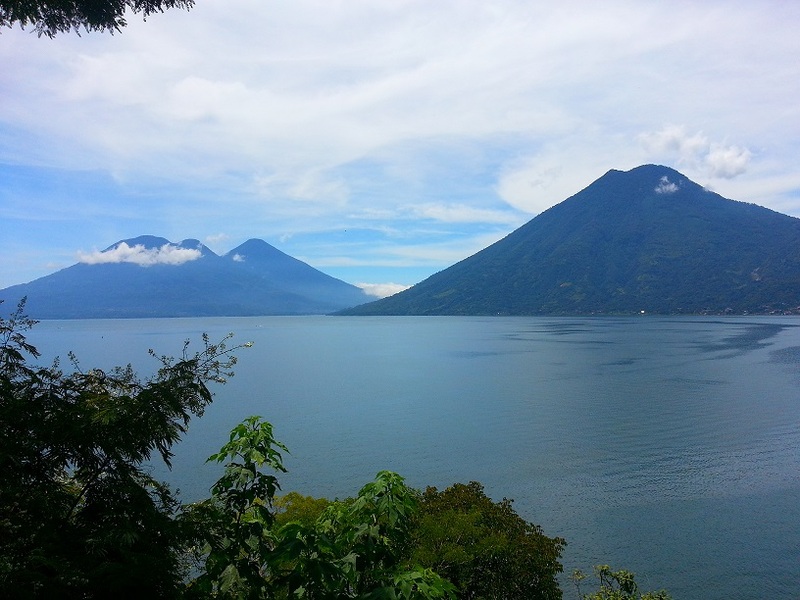 ), we walked down to Lake Atitlan. Wow! It reminded me a little bit of the Bay of Islands in NZ… lovely clear water surrounded by (now dormant) volcanoes. It was beautiful! So beautiful, that we decided to go on a boat tour to some of the villages dotted around the lake. Although they are accessible by road, the roads are windy and in very poor condition – so it was much easier for us to just take a boat across. Firstly though – we moved hotels and ended up being closer to the centre for just over one third of the price. Sure, it wasn’t quite as ‘polished’ – but it was clean and quiet and more than adequate. We could not have had better weather for a day on the water… it didn’t rain at all! Today was the first day in a while that we’ve not at least had an afternoon shower. 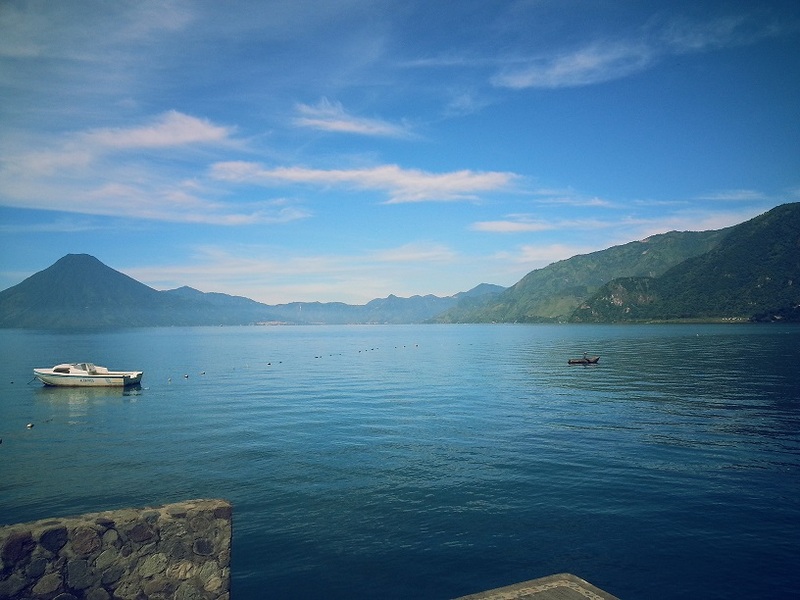 We went to San Marcos, San Pedro and Santiago Atitlan – the first is a hippie gringo yoga/drumming/chanting town; the last is one of the biggest cities in the area with a population of 60,000. I am having some sort of delayed ‘land legs’ experience after rocking on a boat for several hours today. Adrian is jiggling his legs and therefore rocking the table because he is bored and/or impatient, wanting our drinks to arrive. Oh wow, it’s an earthquake. I can see the walls of the building swaying. Adrian hadn’t noticed it – or rather, he’d noticed it, but though that the ground was rumbling because a car was going past, until I said the ‘e’ word. We were on the ground floor terrace of a two story place; people started running from upstairs out on to the street. People in the market stalls across the road also ran outside – including the locals. I started thinking which was the quickest way to higher ground, just in case there was a tsunami (we were maybe 100m from the water). And then the ground stopped shaking and everything went back to normal. The diners from upstairs returned inside, the shopkeepers went back into their stalls, our drinks arrived. Tomorrow we’re going to Antigua where we’ll be for a week! Yes, a whole week. I’ve enrolled in Spanish school for four hours a day; Adrian’s thinking about what he wants to do. I can’t wait!